This morning, we woke up hungry. We don’t have a ton of super easy to make food in the house, but I really wanted breakfast. We didn’t have any milk, so I decided to find a nice fluffy pancake recipe. I found an easy recipe with only ingredients we have in the house. I realized half way through my plans that we don’t have syrup. So,I started this plan what I wanted to put on top of my pancakes first. I decided a strawberry applesauce would be nice. Because I don’t eat eggs, I had to come up with some kind of protein for me. I didn’t just want a chicken breast, as that is boring for breakfast, but have not had much luck making sausage that will stay in patties if I grind the meat myself. 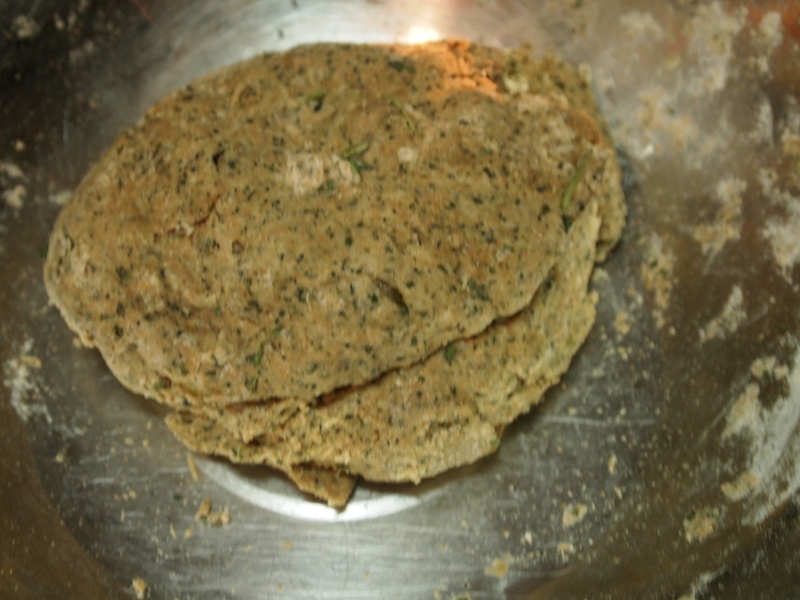 I have a Ninja food processor/blender system, and in the past I have tried making sausage patties by pulsing raw chicken and adding spices, but they never hold together. Today I was wondering how to change this because grinding meat in a food processor just does not work the same as having meat ground in a meat grinder. Well I remembered my friend Nellena telling me to add a little flour as a binder to my potato cakes the last time she came over, and I wondered if that would work as binder for meat as well. I pulsed them ingredients until it looked like it would hold together, and put the meat in the fridge for about 10 minutes while the fruit was still cooking down to let it rest, and let the gluten work and bind. The flour worked! I was so stoked! Today I actually had sausage patties. YAY! Two total firsts in one meal! The pancakes were simple, but I noticed that there was more baking powder than I was used to, and because of that I think the pancakes were extremely fluffy. I wish I would have got a better picture, or a pic with my first over easy attempt, but this is what I got before the food was devoured. I had fun cooking it all, but the best part was that it tastes AMAZING!!!!! Mix wet ingredients together. Mix dry ingredients together in different bowl. Combine the two bowls and stir with hand or a stand mixer. I have a new kitchen aid, and am getting all of the use of out it I can. Get all of the lumps out! Let batter rest for 5 minutes. and put some oil in the pan. Fry the pancakes, flipping when it is full of bubbles. These turn out a little heavy, but very thick and fluffy. I usually hate pancakes, and I LOVE these! Peel, core, and dice three apples. Place them in a small pot and cover them with water. Put in the strawberries and turn the burner on high. They need to break down, and I kept them on a rolling boil to break down the apples a bit faster than usual. Remember to stir every few minutes so the bottom does not burn. I added the a few shakes of cinnamon, and 1/8th teaspoon vanilla, and a pinch of salt as well as the stevia. Add more water if necessary until the fruit is cooked and broken down to your liking. After the apples are soft, throw about 1/2 of the mixture into the blender to break it down a bit faster if you like (or use an immersion blender), but cooking for a few hours will achieve the same effect…basically making a quick strawberry apple sauce. Taste, add more stevia if necessary. Serve on top of pancakes and pour melted butter either on pancakes or on top of topping…Delicious! Pulse all of the ingredients in a food processor until meat is broken down and starts sticking to itself. In a Ninja, that takes 10 pulses or less. Be careful not to liquify or puree the meat. You want a little texture. Let it rest in the fridge for 5-10 minutes to let the flour do it’s job. Next, make patties, and throw them in a frying pan with just a little oil. Next time I will throw a little more seasoning in them, and maybe just a touch of oil to make sure they don’t dry out. Make sure they are cooked all the way through and serve. These are oh so good! 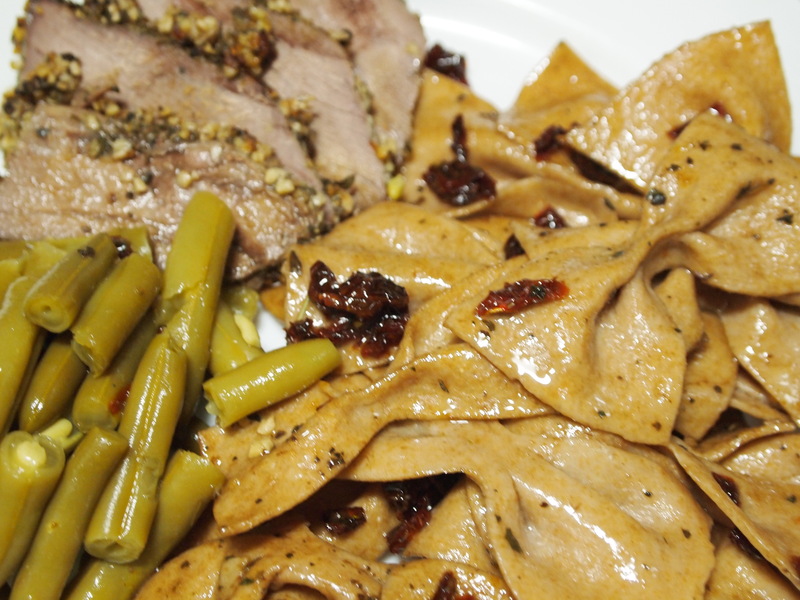 I got some miracle noodles in my last batch from Iherb.com, and they were herb and garlic fettuccine noodles. So tonight, I tried to make fettuccine alfredo with them. I used three packages of Miracle Noodles, and made an awesome almond milk Alfredo sauce. The first thing I did was cook up two chicken breasts in a little olive oil and butter. Once they were crusty and golden brown, I removed them from the pan, and put in one sliced white onion and some garlic. I sliced up the chicken, and threw it back into the pan. Next I added 5 cups of homemade almond milk. I let it simmer for 10 minutes or so until the sauce started thickening up. 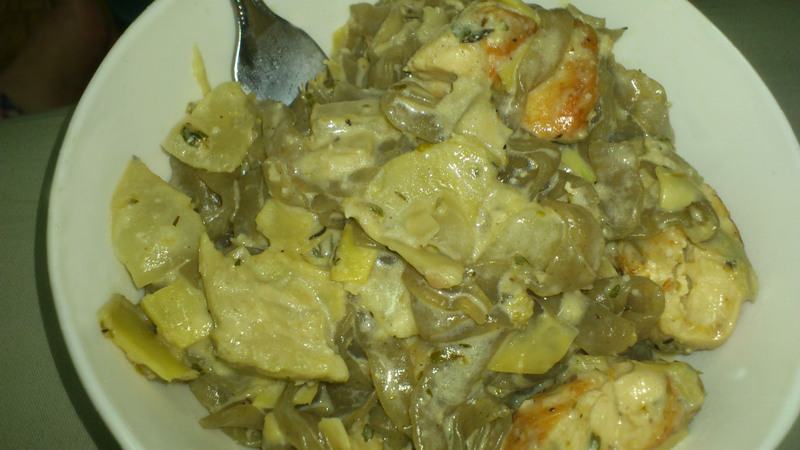 I rinsed off about a cup of marinated/rinsed and chopped artichoke hearts. I added about 1/3 cup of grated parmasan cheese, and salt, pepper, oregano, thyme, and parsley to taste. I opened and rinsed the noodles under hot water, and sprinkled a tablespoon of flour into the sauce just to get it a little thicker. Then I put the noodles into the sauce, and let it simmer for a minute. I flavored with a little chicken bouillon and it was perfect! I was looking forward to trying this, although had a little trepidation because I was not sure if the texture of this noodle would really hold up to a cream sauce. It turns out that the trepidation was well founded, as the texture was really really off, and I found myself craving starchy noodly goodness! SO, my experiment didn’t work as I had hoped. The sauce is amazing, but not with the particular noodles that I made. In fact, for lunch tomorrow, I am going to make some pasta for lunch tomorrow and make another batch of the sauce. First cook the chicken in the oil and butter until it is golden brown and crusty on both sides. Then take it out and while it is resting, slice up one large onion and toss it in the pan with the left over oil. Slice up the chicken and add it back to the pan. Pour in all of the almond milk, and simmer until reduced by 1/3 to 1/2 stirring every few minutes and scraping the bottom of the pan. sprinkle a teaspoon of flour in at a time until it begins to thicken I didn’t use more than a tablespoon. Grate in parmasan cheese, and continue stirring. Also add the artichoke hearts, and let cook for just a few minutes. Once the sauce is done, add the noodles into the pan. Once they are all mixed together you can serve. The sauce is so easy, and on real noodles it tastes amazing. However, this meal was very low in carbs and had lots of protein in it. I have not figured out the WW numbers, but this honestly can’t be too bad! Ever since 2000, when I went to Greece, I have been in LOVE with Greek food! I have made gyros, and Greek salads, and even a kebab which may have actually been more Turkish but whatever. One thing I made for my mom and granddad when I got home, but had never made again was Moussaka. 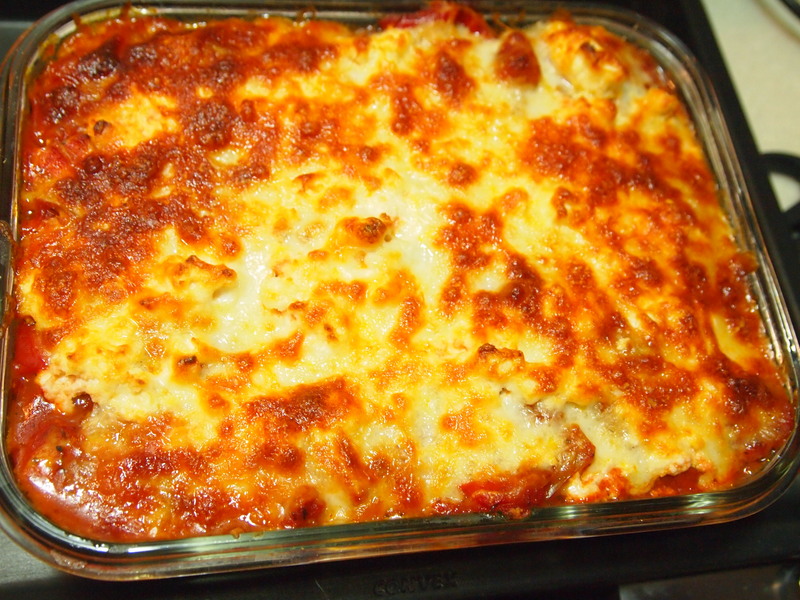 A delicious dish described as Greek lasagna, or a casserole. I had an awesome recipe, which I don’t have with me in Korea, but I have been thinking about it ever since. My challenge with Groove Magazine has me pulling out Korean ingredients trying to incorporate them into my every day life. Well, one food that I don’t usually use, but have been thinking about for a long time is eggplant. I have some ground lamb in the freezer from Itaewon (the foreigner district in Seoul), and now I have eggplant in the house at the same time! What is more perfect that making a traditional moussaka?! Okay, I cheated a bit, and it would have been less weight watchers points had I not cheated, but I didn’t feel like making both tomato sauce and a white sauce in my tiny kitchen at the same time. So those came from jars. After searching some general recipes on youtube and perusing several different written recipes (although mostly going from memory), I compiled my own recipe. The first thing I did was wash 3 small potatoes. I used a mandolin to slice them up very thin and quickly fried them at a high temperature just to make the outsides brown. Then I did the same thing with thinly sliced egg plant. I did learn that I should probably slice these things by hand, or at least with a thicker attachment on my mandolin, as the cuts were too thin, browned very quickly almost to the point of burned, and the eggplant cooked into almost nothing. I peeled the eggplant before slicing, as after doing some research, I found out that unless they were fresh, the peel could be chewy. Next, I diced up two onions, and two cloves of garlic. I put them in a frying pan with just a little oil (using up what was left over in the pan from the potatoes and eggplant. Once they started getting clear, I added in 250 grams of ground lamb. I stirred it together and let the meat cook. Once the meat had turned brown, I added 1/2 of a jar of roasted garlic sauce into the pan. I stirred it, and let the meat soak up the sauce. I wanted the meat to be the star, and wanted it to be very thick, so I did not overwhelm it with too much sauce. I removed it from the heat when the liquid had cooked out a little, and it was very thick. Next, I layered ingredients like a lasagna into a pan. I put a layer of potatoes, then egg plant, then meat. My pan was not yet full, so I did that a second time. After finishing with three layers of potatoes, three of eggplant, and two of meat sauce, I heated up 3/4 of a jar or roasted garlic Alfredo sauce and poured it over the top. I then topped it off with a sprinkle of dried parsley, and a light dusting of freshly grated Parmesan cheese. I scoped out 4 servings from this pan, at 17 weight watchers points per serving. Luckily I had enough points today for two servings, however, I only ate one. After the two meals with lamb that I have made recently, I am learning that I really don’t like the stuff very much. this is a sad realization but true. Anyway, the food turned out amazing. If the sauces had been homemade, it would have been so much more incredible! I have a friend who writes for a magazine in Seoul. She has asked me to incorporate some “Korean-y” foods into my diet, and write a journal about a westerner trying to loose weight in Korea. Well, I agreed to throw in one new ingredient every week, while I am on this 100 day journey (for the article). 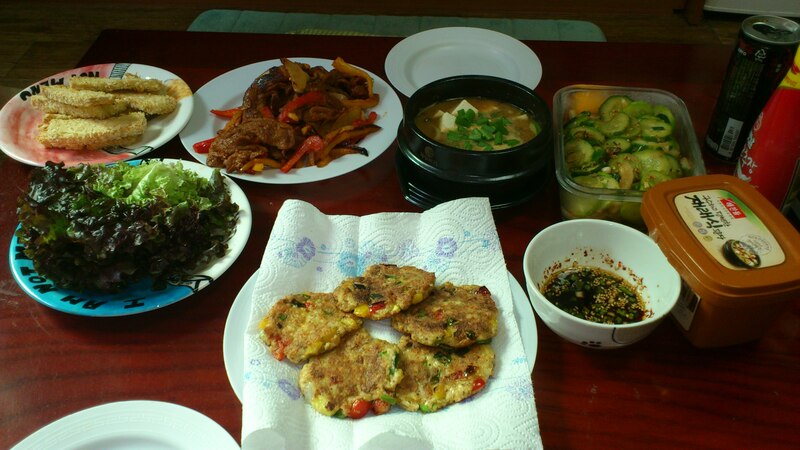 Since I really don’t know about cooking Korean food, or what she might consider “Korean-y”. She came back with a small list, and on it was tofu. The first thing I did was call the one vegan I know and ask for help! I need tofu school because I have always been pretty scared of the stuff, but also intrigued and wanting to learn how to use it. The only way I have ever liked it was in spaghetti sauce at a daycare I worked for in college. She was happy to share her knowledge of both Korean food, and tofu with me, and set out quite the spread to give me a variety of foods to try made with tofu, or soy meat. Here is the amazing Tofu Meal that My friend Emily of Justwhatgrows.com made for me last weekend. It was quite the spread, and just about everything was made with tofu or soy. I was very impressed. I think the doenjang soup was my favorite part of the main course, and I will be making her dessert sometime! She made tofu banana bread! Anyway, she sent me home with a block of fresh firm tofu to use how I pleased. I have been craving lasagna for the past several weeks, and since I knew that I was okay with tofu in spaghetti sauce, I decided this would be the perfect place to try my first tofu recipe! I don’t have any ground beef right now, which is very expensive in Korea anyway, so the timing is perfect. 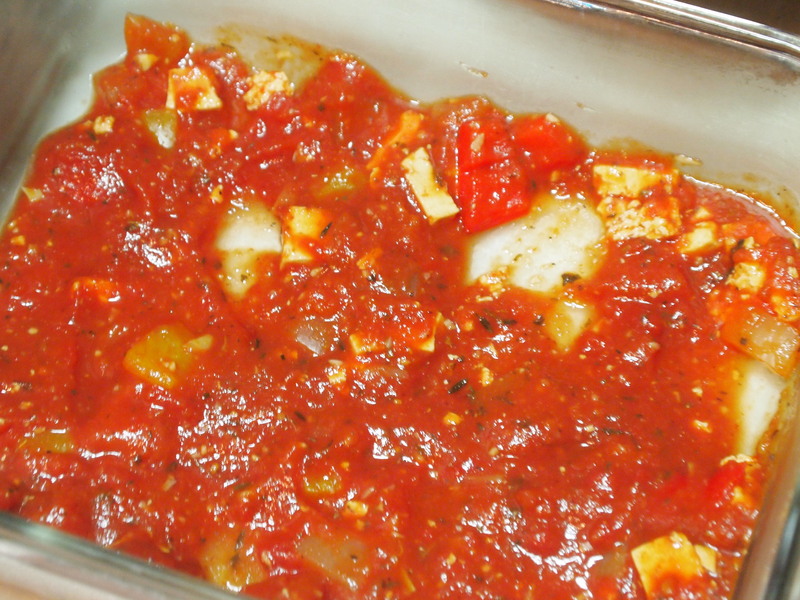 I started out with a tomato base, using a can of ready cut S&W chopped tomatoes. 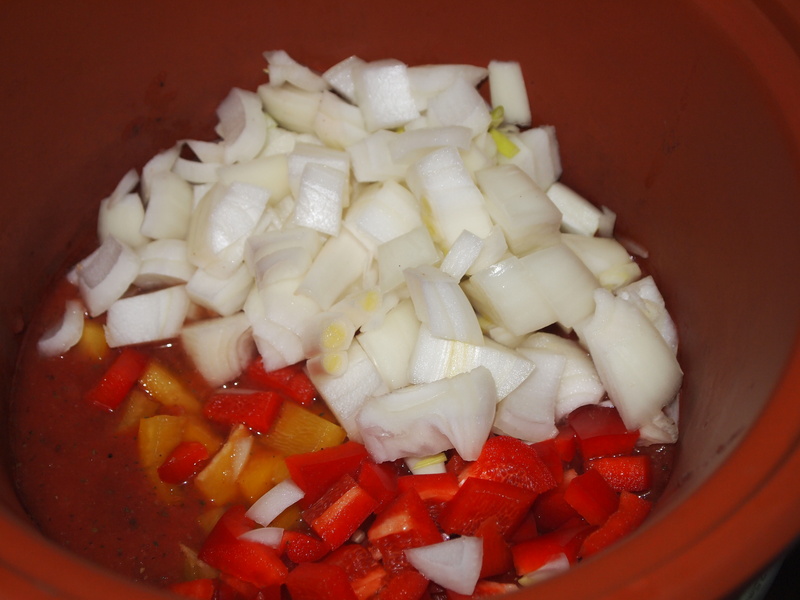 I pureed them, added 2 small white onions, one red bell pepper, and one yellow bell pepper. 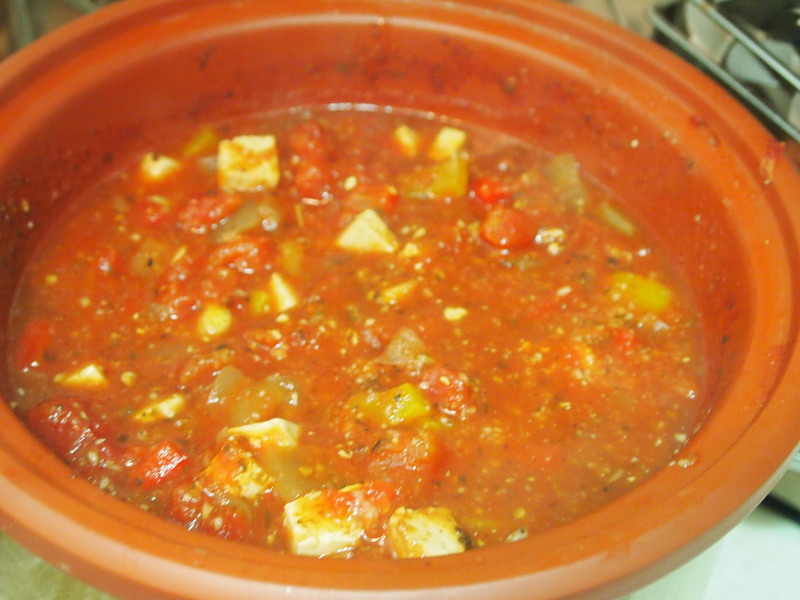 Next I cubed up the entire block of tofu, and added two more cans of chopped tomatoes to the mix along with maybe a tablespoon of both thyme and basil, and maybe three tablespoons of minced garlic. I put the lid on the crock pot and turned it on low. I let it cook for about seven hours. I added salt and pepper to taste (my husband said there was not enough salt, but he likes more than I do). 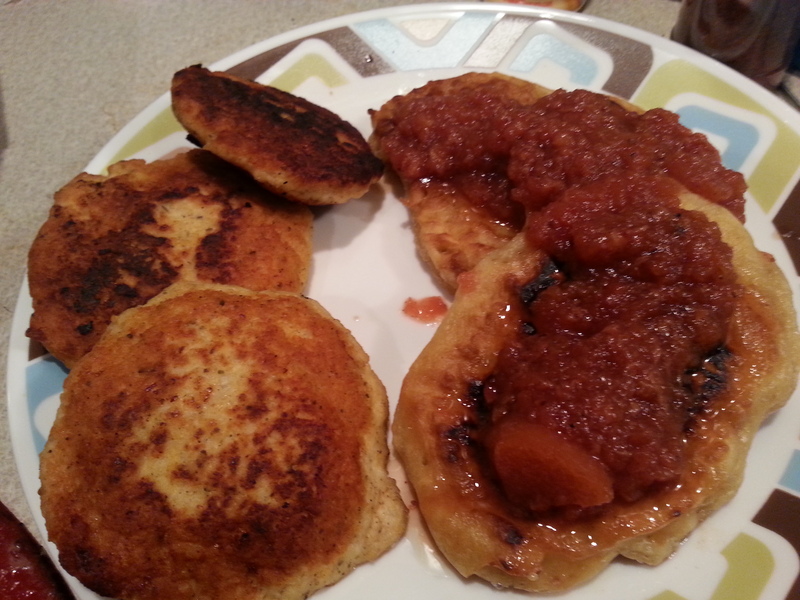 I did wind up adding a 12 oz can of Hunt’s tomato paste to the mix because the sauce was a lot thinner than I wanted it. I started adding a little at a time, but I do like a thick sauce, so I wound up using the entire can. 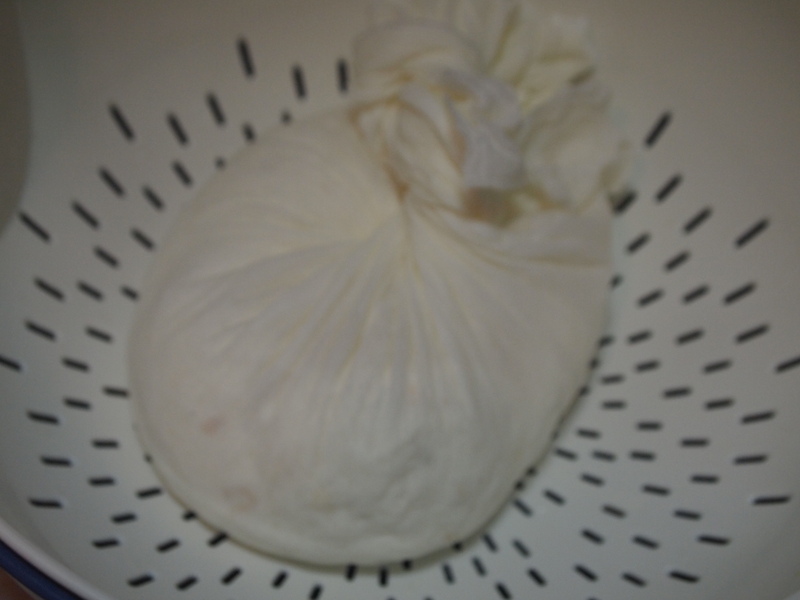 Next I made Homemade nonfat ricotta again. This time, I strained it differently and the texture turned out very dry. 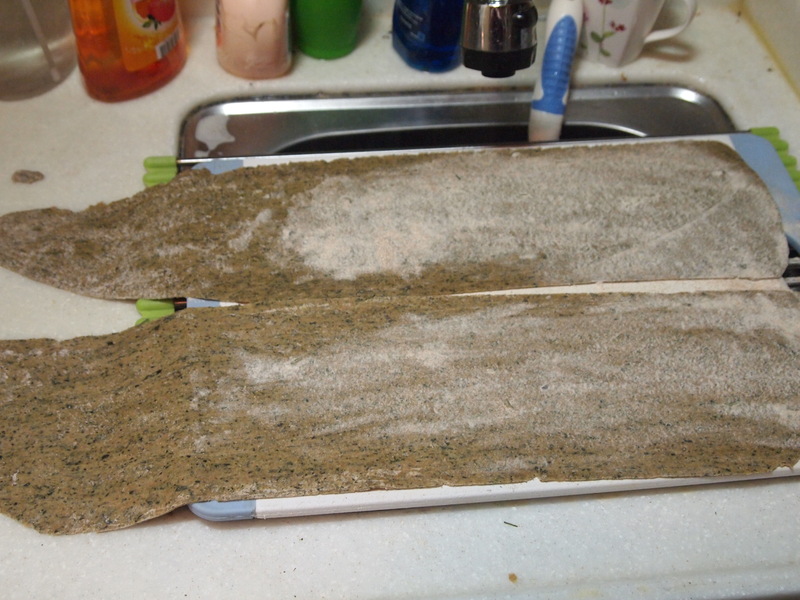 See the other blog for detailed instructions, but her are a few photos of it being made this time. 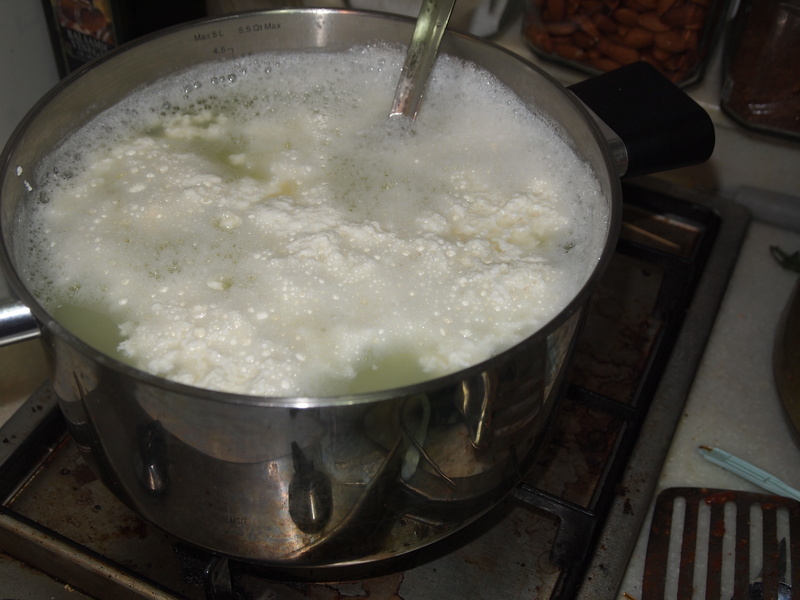 Heating milk and lemon juice to 185 degrees F.
The cheese separating from the whey. The cheese straining, and being separated from the way. This strained a lot faster than the bag I had used, and the cheese dried and became crumbly very quickly. The cheese still draining, and actually drying out quite a bit. I am used to it more creamy than dry. I added 2 tablespoons of olive oil, and slowly added 3/4 of a cup of water. Only add water as needed to wet the ingredients and make a stiff/not sticky dough. 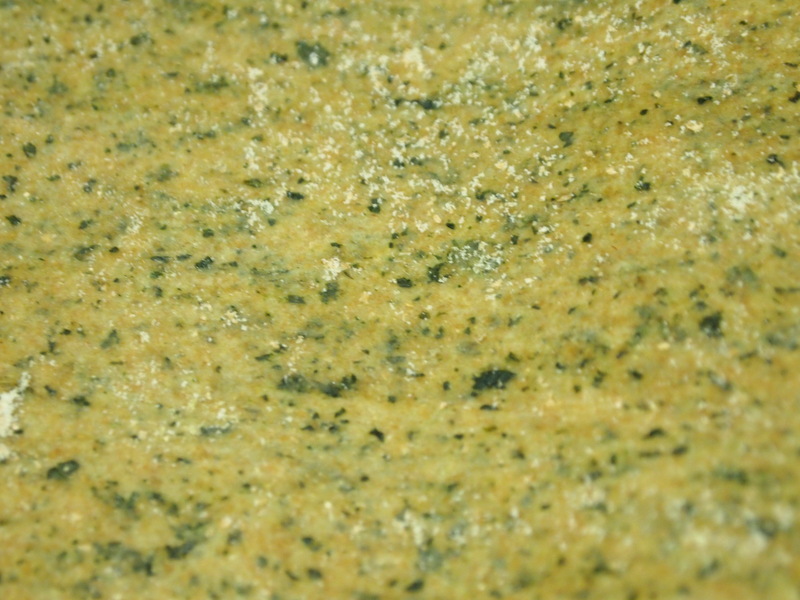 Here is a closeup, you can really see the spinach, and the noodles tend to turn green when they are cooked. Next, you start layering in your pan. 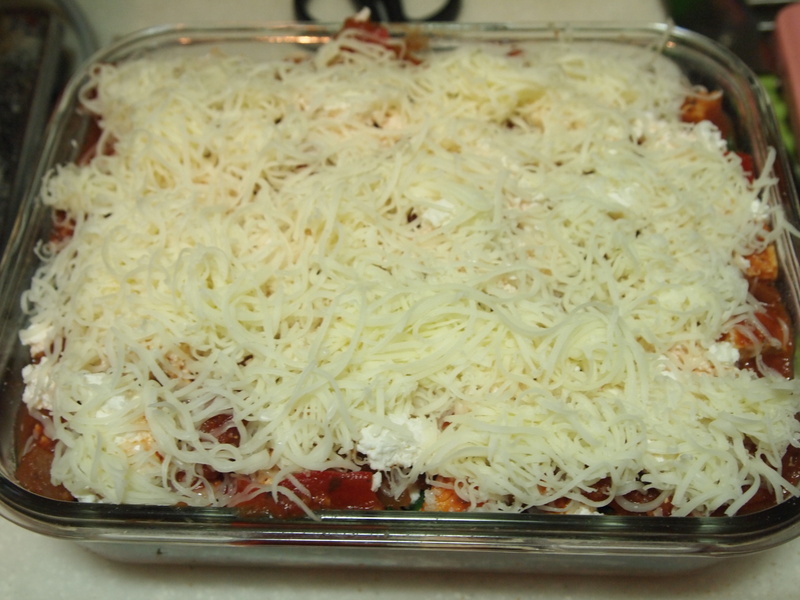 I start with a thin layer of sauce so the lasagna does not stick, then line the pan with a sheet of pasta. Since it is fresh (and I don’t use eggs), I don’t cook my pasta first. the oven will do that part for me. ricotta cheese, and a tiny bit more sauce. Add another sheet of noodle, and more sauce. 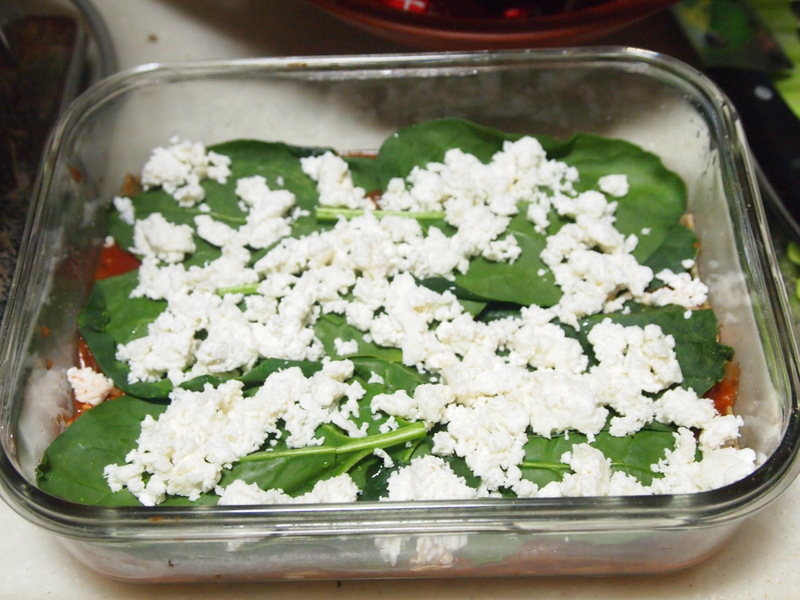 Add another layer of spinach (fresh or frozen and well drained) and another layer of nonfat ricotta cheese. I would love to do more layers, however I don’t have the pan for it, so after a second layer, top with another noodle sheet. On the top, put more sauce, then a layer of ricotta, and top with part skim mozzarella cheese (this is the first time I have seen DRY, Part SKIM mozzarella at E-mart). Next I baked it on 175 degrees Celsius (350 F) for about 30 minutes, until the top looked amazingly crunchy and brown! 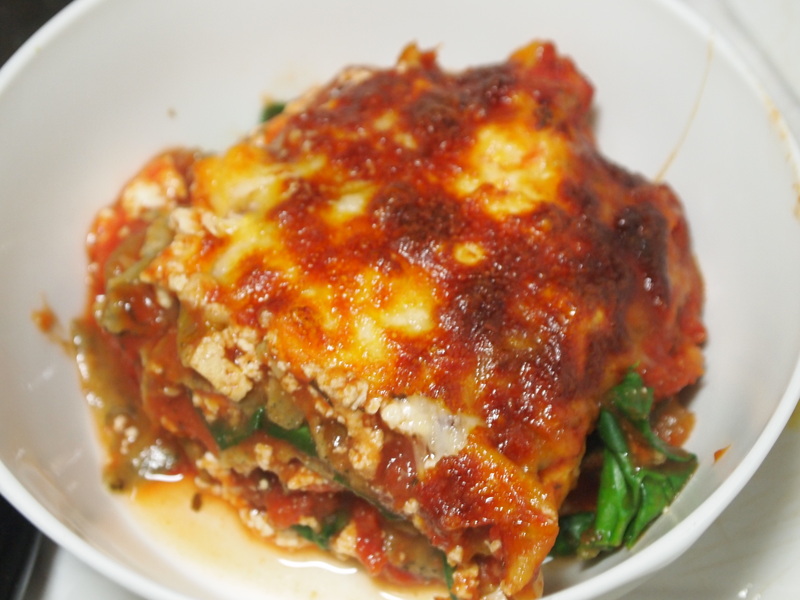 You have to admit, the top of this lasagna looks picture perfect! 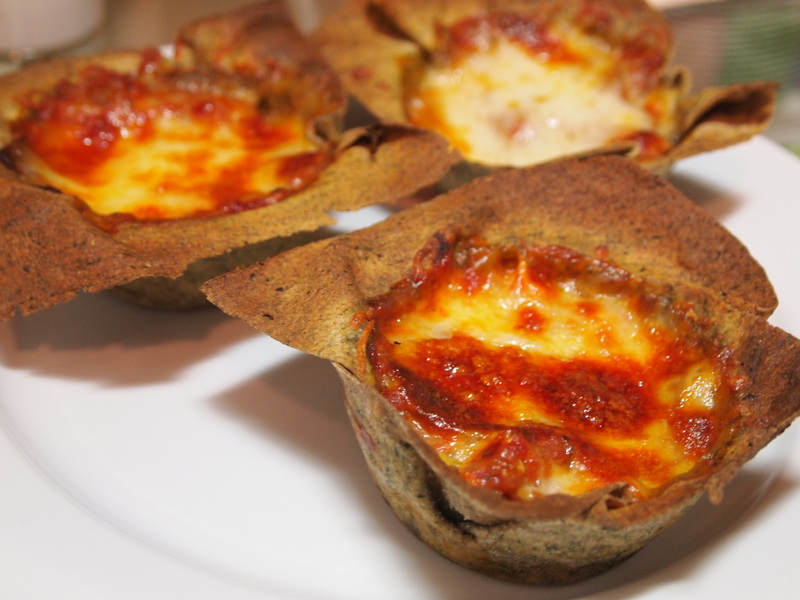 Still having 1/3 of my pasta dough, and extra sauce, cheese and spinach, I also finally used inspiration from pinterest and made petite lasagnas. This is one of the first things I ever pinned on pinterest, but had not gotten around to making yet. I did not actually layer these. The muffin tin was oiled, and then covered in the noodle, which was rolled out as thin as my machine rolls (#6). 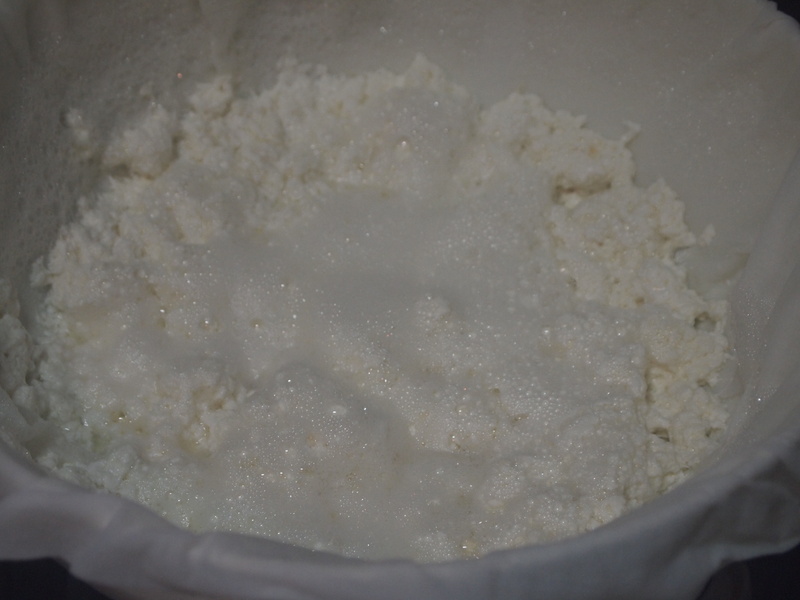 On the bottom there is a layer of ricotta. Then over that is sauce, and spinach. Above that is more sauce, and then it is filled to the brim with mozzarella cheese. They hold their shape pretty well, and look amazing. I am taking one to my co-worker today who heard I was making lasagna for dinner last night and she commented on all the cheesy goodness and about drooled.. Honestly, I can’t blame her! This finally used up all of my sauce. 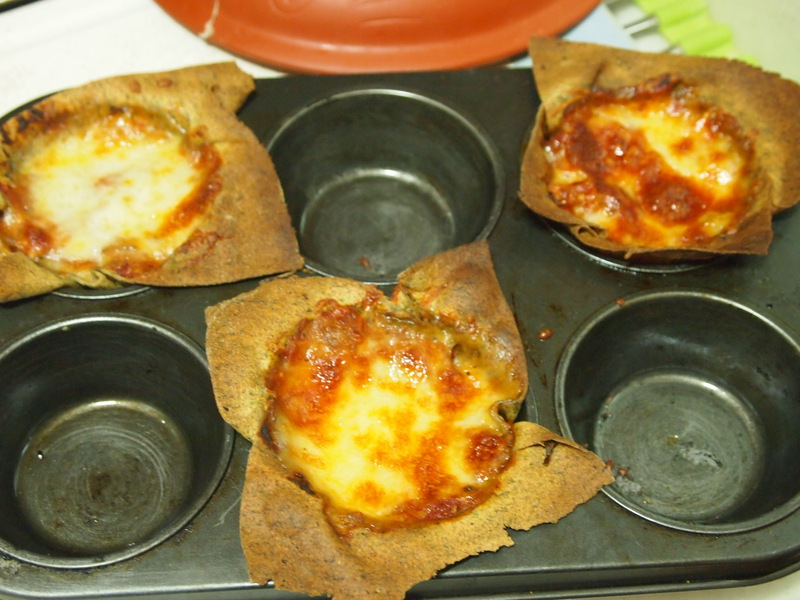 The pan made 4 generous helpings, between the two frozen trays, I have 4 more, and 2 cups should be a serving as well, so this recipe made about 11 servings, and even with all the cheese, was only 8 weight watchers plus point per serving. Now, what I am really impressed with; the tofu and the ricotta both had about the same texture, and because I cubed it and didn’t crumble it, I could tell the difference, but in my mouth, it all tasted about the same. I did miss the flavor of the ground beef, but overall, my first experiment with tofu was a huge success! Just enough water to make the dough stiff and forming a ball…not enough to be sticky. 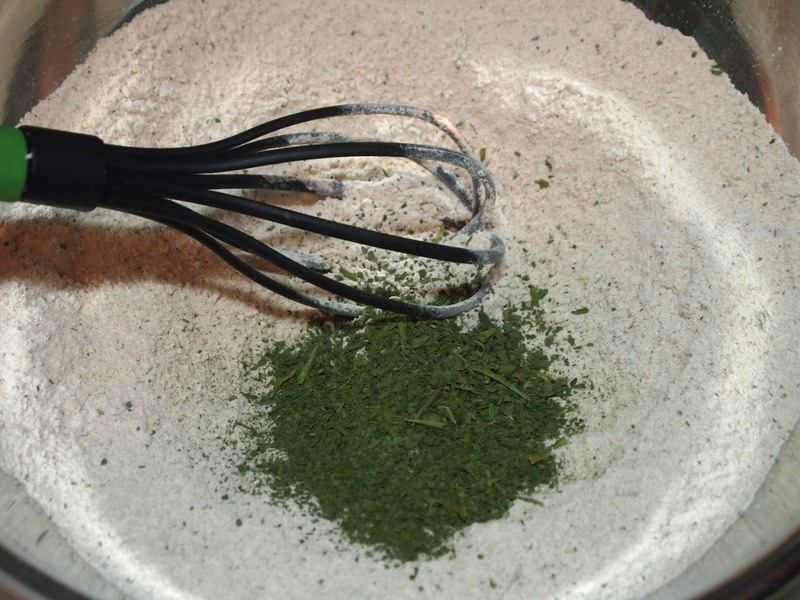 Whisk together the flour, salt and dried spinach powder. Add the oil, and mix with your hands to distribute it through the entire bowl. Slowly add flour 1 tablespoon at a time and keep mixing with your hands letting the dry flour soak up the water before mixing too hard. Add water just until all of the flour forms a ball, but is still very dry feeling. Knead for several minutes. Until it has a pretty even texture. Add in extra water or flour if you need to to keep the fairly dry consistency. I used a total of ¾ cup of water. Roll out to the thickness you want your noodles to be. Mine was about 1/8 of an inch, but I have done them as thick as ¼ inch (when they are that thick I recommend boiling them for a minute or two before cooking, the thinner they are, the less likely you need to do this). Cut to size and use in lasagna pan. Dissolve the citric acid in the water. 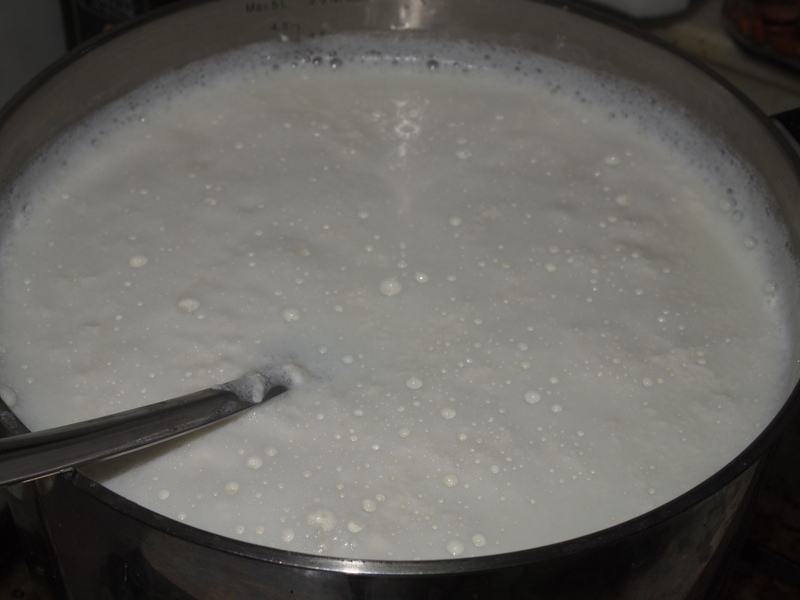 Heat the milk, citric acid solution and salt to 185 F or 85 C stirring often to prevent scorching. Skim away the scum as it rises to the surface. When the milk reaches 185 F remove from the heat and allow it to set for ten minutes. 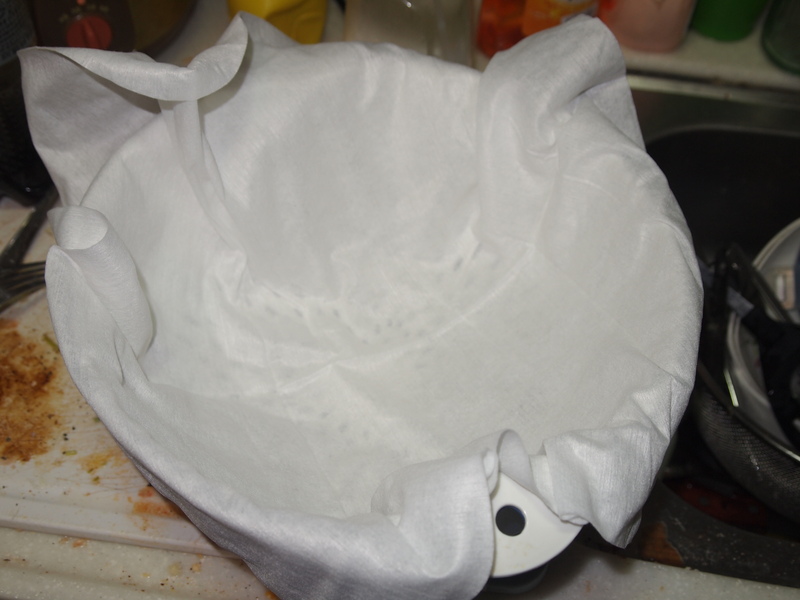 Drain the curd for at least 1 and up to 3 hours under refrigeration in a cheesecloth lined colander or a muslin bag set over a towel. The cheese is now ready to use. Alternatively, transfer to a storage container and hold covered under refrigeration for up to one week. 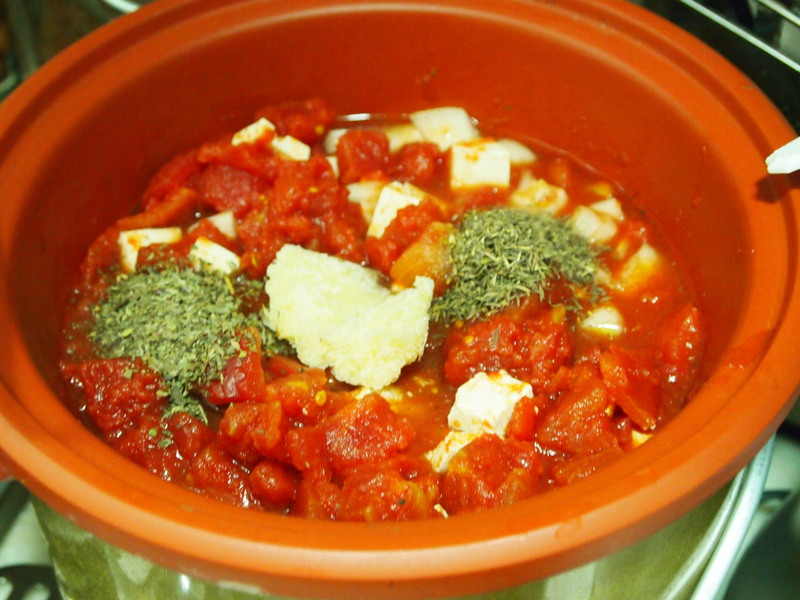 Puree one can of tomatoes, then chop up all veggies and put everything except for the tomato paste into a crock pot. Let it simmer on low in the crock pot for probably 4+ hours (I had it on for 8) and see how it is doing. If it is thin, add some tomato paste, and let it thicken a little. If it is really thin, add up the whole 12 oz. can, like I did. Put a layer of sauce down in the pan. Cover it with a sheet of pasta. Next add a layer more of sauce, then sprinkle some crumbled ricotta cheese, and a layer of spinach. Put a little more sauce, and then another layer of pasta. Next do the same thing over again one more time. Make as many layers this way or by changing up what you put into the layers as well, as your pan will let you. I put one a little more sauce, one last pasta sheet, more sauce, the ricotta, and instead of spinach this time, I covered the top with part skim mozzarella cheese. Bake for 30 minutes or so at 175 degrees C, or at least until the cheese is brown and delicious on top. This recipe actually could make 16 generous sized portions. I wound up making one small pan for dinner/lunch, 2 smaller pans (individual tv dinner size) for the freezer to eat another night, and a little extra for lunch for me today. Portion wise, without any side dishes, Each my husband and I got 8 meals out of it, and I still did not wind up using all of the pasta dough. So if you make my recipe exactly, be prepared to make a lot. I have a back log of recipes to post, maybe 3-4 between last week and this, but I want to post this one while it is still fresh on my mind, as this it the first time I have posted my fresh pastas. My husband and I started Weight Watchers this week. We figured out our “point allowances” and since mine is drastically lower than his, I just have to drool when he can go back for seconds. Well one benefit of doing the online program is that you get access to thousands of recipes on WeightWatchers.com. Knowing that I had some beef thawed at my house, I went through some of their recipes until something caught my eye. It was a recipe for herb crusted filet minion. Granted I can’t afford that cut of beef in any part of the world, so I had to adjust to what I had…As I said before, the cut I get is mysterious to me, but today we are calling it a tenderloin, because that is what I put the points for on my points tracker today! First when I started cooking, I started mixing oregano, basil, garlic, black pepper, rosemary, and a pinch of salt in a bowl. I used maybe 2 tablespoons of garlic seasoning, and 2 teaspoons to 1 tablespoon of all the other herbs. One teaspoon of black pepper, and just a pinch of salt. Then I washed the meat, and started coating it. I rubbed the seasoning mix into the meat, as I coated the whole chunk; top, bottom, and all sides with the seasoning mix. Then I put it under a broiler for maybe 15 minutes on one side, and turned it over carefully to do another 15 minutes on the other side. We like our meat well done, so that is 160-170 degrees farenheight. If you like it a bit pinker, don’t let the meat get so hot! while the beef was in the oven, I made fresh pasta. I used two cups of Bob’s Red Mill whole wheat flour, 2 teaspoons of olive oil, and I mixed them together with my fingers until the oil was well incorporated. then I added in a teaspoon of water at a time, mixing with my hands until a stiff dough was formed. I added just a little too much water, so I had to keep adding flour to keep the dough from being too sticky going through the pasta roller. Anyway, I kneeded the dough until well mixed, and pulled a small amount off. I ran it through the pasta roller to get a sheet, going down to 5 on how thin I made it (6 is the thinnest my roller goes). After rolling the dough out into sheets, I cut it into small rectangles, and pinched the centers…I love making bow tie pasta, it is so much fun! I boiled it for maybe three minutes before straining. I cooked it in batches so it didn’t all stick together in the pot, and once it was all drained, I poured in 2 tablespoons of olive oil, 1 tablespoon of balsamic vinegar, a generous sprinkling of dried basil, and a cup of halved cherry tomatoes. *Note, I was starving and forgot to take any pictures before we scarfed down this meal. I used all of the fresh cherry tomatoes, so for the one in this picture, I used marinated, dried cherry tomatoes. I will post that recipe soon. The meal was savory, and rather filling. I am sorry I don’t have more photos of the process to show you. I was kinda out of it this evening, and not really thinking about taking pictures. Anyway, if you want to try it, enjoy!